Assessment of copper canisters for spent nuclear fuel requires means for detecting and sizing voids as small as 1 mm in diameter, located up to 4 mm under the surface. Eddy current technique for the detection and characterisation of deep voids in copper is presented in the paper. Results were obtained using two deep penetrating probes, the standard MDK 33 from Rohman, and a specially designed probe MDF 1201 from Leotest. The detection ability of the above probes was evaluated and compared using a specially designed sandwich specimen. The specimen was designed to simulate voids with different volumes, located in copper at different depths. Eddy current responses of the two probes were acquired using an automatic scanner for a number of artificial voids with different depths and volumes. The method of defect characterisation (estimating void depth and size) was established. It was shown that the detection of artificial void (cylinder with diameter 1mm and height 1 mm) located at the depth of 4 mm was possible using the probe MDF 1201 at the test frequency of approx. 700Hz. It appeared that defect characterisation was relatively simple task consisting of two steps, estimating the void depth based on the phase angle of its response, and using EC response amplitude for estimating the void diameter. This paper discusses the use of eddy current technique (ET) for detecting deep subsurface defects in copper. The ET is intended as one of three NDT techniques used for assessing the integrity of the circumferential electron beam (EB) welds between the lid and walls of the copper-lined canisters developed by SKB (Swedish Nuclear Fuels and Waste Management Co.). The canisters that will be used for encapsulation of nuclear spent fuel have the form of 5 m high cylinders with diameter of approx. 1 m (for details see (1)). The canisters are sealed by means of an EB weld, which has to be inspected nondestructively. Due to the radiation emitted by the nuclear waste encapsulated in the canisters the inspection must be carried out completely automatically. Three complementary NDT techniques have been developed for this application: a digital X-ray system, an ultrasonic array system (more details in (2)), and a deep penetrating ET. The ET is used for increasing the probability of detection of the most critical defects located up to 4 mm under surface of the canister outer wall. The defects that result in the EB welding process take the form of voids located in the weld zone. Specification for the ET requires detecting and sizing voids as small as 1 mm in diameter, located up to 4 mm under the outer canister surface. Preliminary investigation of a conventional ET has shown that penetration depth obtained using a suitable commercially available probe fed with frequency in the range of 1 kHz would be sufficient for the application. Results of a detailed study aimed at optimising the detection and sizing deep flaws in copper are presented in this paper. The EC probes that have been compared in the study are listed in Table 1. The detection ability of the above listed probes was evaluated and compared using sandwich specimen presented below. Dependence of eddy current responses on the defect parameters (defect depth and size) was established and used for the development of defect characterization method. Special test specimen was designed and manufactured to simulate voids in copper of different volumes located at different depths. The specimen has the form of sandwich consisting of three layers: the upper layer for simulating given depth, the middle consisting holes, and a bottom plate (see Fig. 1). To assure minimum gaps between the plates a special system of air channels that facilitated pumping out air from the space between the plates using a vacuum pump was machined in the upper and the base plate. Then the atmospheric pressure pressed the plates together. Fig 1: Test object, simulating voids with certain volume located at certain depth. The depth of the voids, td could be varied by changing the thickness of the upper plate. The void volume was a function of thickness of the middle plate tv and hole diameter dh . Each middle plate consisted 4 x 3 = 12 holes with different diameters; all plates had identical hole locations. A series of measurements was performed to evaluate and compare the performance of the selected probes. Linear scans of six holes with diameters dh in the range from 0,8 mm to 3,0 mm, placed under upper plates with depths td from 1mm to 4 mm, were performed. The holes had different volumes due to the variable thickness tv of the middle plate (cf. Fig. 1). The volumes of the test holes varied from 0.5 mm3 (for dh = 0.8 mm and td = 1 mm) to 28,3 mm3 (for dh = 3 mm and td = 4 mm). The EC signals were acquired in each scan and the respective signal amplitudes, phase angles and signal to noise ratios (S/N) were estimated. Fig 2: Example of response of the Probe MDF 1201 to 3 different holes. Dashed line defines signal phase and interval between the dotted lines is a measure of signal amplitude. The probes were scanned in contact with the upper Cu plate using an XY scanner connected to a PC based EC acquisition system. Due to the specimen geometry and the scanner size only three holes could be scanned at a time and therefore the results obtained for the respective scans for each combination of upper and middle plate thickness are slightly different. The probes were connected to ESR Rohman PL.E EC instrument and the following parameters were chosen: operating frequency 720 Hz, probe excitation 50W gain 60 – 85 dB (depending on upper plate thickness), filter DC to 8 Hz . The MDK 33 is a deep penetrating, multi-differential probe developed for aerospace applications. It has a considerable size (square 25 x 25 mm) and a high penetration depth. The probe is made up of four different windings forming a cross pattern. 2D response of this probe is shown in Figure 3a. The MDF 1201 probe, developed by LEOTEST Lvov belongs to 2DD family that will be presented in detail at the same conference (3). It has very similar characteristics to MDK 33; it is also a deep penetrating, multi-differential probe but with a smaller size (diameter 13 mm) and a very high penetration depth. The 2D response of this probe is shown in Figure 3b. The 2D responses reveal that both probes are build of four separate windings arranged in a cross pattern. 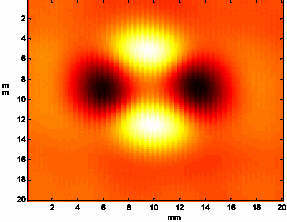 Probe symmetry can be easily evaluated based on its 2D responses. It is worth noting that the EC patterns in the impedance plane obtained when scanning small defects with the multi-differential probes depend strongly on the direction of scanning. If scanning is performed along one of the probe axes shown in Fig. 3 the probe has a quasi-absolute asymmetric response shown in Fig. 4. The response may have a positive or negative sign depending on the chosen axis of scanning. In the worst case when the direction of scanning is diagonal, the probe response may be very week and may differ considerably from the patterns shown in Fig. 4. This means that care should be taken when performing sparse scanning using probes of this type, especially when the acquired EC signals are to be used for sizing of the detected defects. Fig 3: 2D responses of the probes measured as their response to a small hole in copper plate (note different scan areas). Probe MDK 33 (a) and Probe MDF 1201 (b). Fig 4: EC patterns of the probes measured as their response to 3 holes in a copper plate. Probe MDK 33 (a) and Probe MDF 1201 (b). The EC patterns shown in Fig. 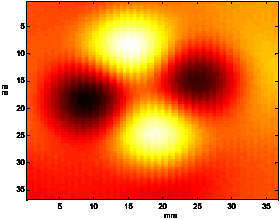 4 acquired as a single line scan along 3 holes with different diameters reveal strong similarity of the probes. Shape of the EC Pattern allows judging the relative position of the probe and the scanned holes. If in the scan shown Fig 4, the hole line was adjusted accurately with the probe axis the responses would be symmetrical (no double lines would be observed). The above-presented probes were used for scanning the specimen shown in Fig. 1 and thickness of the both plates was changed from 1 to 4 mm to simulate voids with different volumes located at different depths. The linear scans were acquired for different hole diameters and the EC data was saved and processed off line to evaluate phase, amplitude and S/N as a function of hole diameter, depth and volume. The first step in data processing was phase evaluation. This was made manually using the method illustrated in Fig. 2. In the second step the signal was rotated to align its phase with the vertical axis. The amplitudes and S/N ratios were evaluated using the vertical component in the next step. Examples of the responses measured for three holes located at the depth o 3 mm are shown in Fig. 5 and the their vertical components used for the evaluation in Fig. 6. Fig 5: EC responses of the probes to a 0.8, 2 & 3 mm holes in copper plate at the depth 3 mm. Probe MDK 33 (a) and Probe MDF 1201 (b). From Fig. 6 can be seen that a hole with diameter 0,8 mm located at the depth of 3 mm can be detected using both probes, the corresponding S/N was 4 to 7 dB for the MDK 33, and 6 to 8 dB for the probe MDF 1201. The signal to noise ratio was influenced by the hole volume (thickness of the middle plate tv). However, as shown in Fig 6, the same hole located at the depth 4 mm could not be detected by the MDK 33 while the S/N observed for the MDF 1201 was 2 to 3 dB. Fig 6: In-phase components of the EC patterns shown in Fig. 5. Probe MDK 33 (a) and Probe MDF 1201 (b). Absolute signal levels measured for both probes as a function of the hole diameter and with hole depth as parameter are presented in Fig. 7. Fig 7: Signal level as a function of the hole diameter for various depths td. (a) Probe MDK 33. (b) Probe MDF 1201. Distinct phase differences depending on the hole depth were observed for both probes. Phase information together with the response amplitude enabled reliable defect sizing. It should be noted that phase of the EC response should be measured as shown in Figure 2, i.e., as an angle of the tangent to the responses with different amplitudes. The conventional measurement of an angle of a line connecting a point with the maximum amplitude with the origin of coordinates resulted in an undesired variation of the phase angle with response amplitude. The tangent angle seems to be more robust parameter uniquely defining defect depth. Fig 8: Phase angle as a function of hole depth for scan A. A straight line estimated from the mean phase values is also shown. The result of linear phase approximation can be seen Fig. 8. A linear regression based on mean values of phase angles corresponding to different hole heights resulted in a straight line (diamonds in Fig. 8). This means that this line with a slope of approx. 40° per mm can be used for the estimation of defect depth. Fig 9: Signal level as a function of hole depth for hole diameter 2mm. When the hole depth td is known its diameter can be estimated form a family of curves shown in Fig. 9. From Fig. 9 can be seen that the response amplitude does not depend on the hole height for the tv = 2 to 5 mm. It appeared strange that a different curve was obtained for the tv =1mm, however, closer examination has shown that the conductivity of 1mm plate differed from that of the other plates. Difference in responses was also observed when this plate was used as an upper plate for simulating 1mm depth (td = 1mm). Sensitivity: It is possible to detect holes as small as 1 mm diameter at the depth of 4 mm in pure copper using a deep penetrating EC probe and a frequency < 1 kHz. Hole with diameter 0,8 mm at the depth of 4 mm was detected with S/N = 3 dB using probe MDF 1201. Phase angles change linearly with the hole depth td, however, they are relatively insensitive to the hole height tv. Signal amplitude (level) increases with the hole diameter and decreases with the hole depth td, however, it is relatively insensitive to the hole height tv. The dependence between the hole diameter and signal amplitude is linear while dependence between hole depth and signal amplitude is exponential. Signal to noise ratio S/N increases with the hole diameter and decreases with its depth td , however, it is relatively insensitive to the hole height tv. C-G. Andersson and R.E. Andrews “The Development of Advanced Welding Techniques for Sealing Nuclear Waste Canisters”, Presented at 2001 MRS Sprig Meeting, April 2001, San Francisco, SKB report, TR-01-25, pp.47-52. T. Stepinski, P. Wu, M.G. Gustafsson and L. Ericsson, “Ultrasonic array technique for the inspection of copper lined canisters for nuclear waste fuel”, Proc of the 7th ECNDT, Copenhagen, May 1998, pp. 1377-1383. V. Uchanin, G. Mook and T. Stepinski, “The investigation of deep penetrating high resolution EC probes for subsurface flaw detection and sizing”, to be presented at 8th ECNDT, Barcelona, June 2002.